New to spearfishing and want to learn more about the different techniques used to hunt bass and various other species? 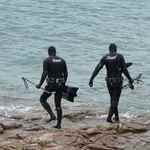 Below is a brief summery followed by some in depth articles of the various aspects of spearfishing techniques within the UK and abroad. 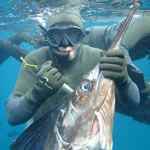 In the UK spearfishing by far, normally all happens at the bottom of the ocean – right at the bottom. If you’re not hugging that rocky floor or right in among the kelp then you’re probably not going to be very successful. You may start off being a surface hunter but the odds of success are massively increased using other techniques. The most popular type is the ambush but you will find that the guys who win all the competitions are veteran hole hunters and this is what you want to moving towards. Fortunately for us, most fish are quite curious and will often come to take a peek at you when you land in their neighborhood. Some people will even twang the bands on their speargun or try to make croaking sounds just to announce their presence and hopefully entice in a previously unaware fish. Albeit the last desperate hope of a fish-less dive. The curiosity of fish varies massively. While Pollock tend to be more obliging to the would-be spearo, other fish like bream tend to stay frustratingly out of range. Bass on the other hand vary from fish to fish. Some can be nervous, darting in and out while others look like they could ram you out of the way! They can suddenly engulf you in shoals or cruise around on their own, there are no predictable expectations so just be ready for all potential outcomes. Another thing to note is that generally you want drop in to fish-ville as smoothly and silently as possible. While fish tend to want to check you out, you need to not scare them off by thrashing around on the surface trying to start your dive. Instead of doing a full handstand formation to begin your dive, try just lifting up one leg. You will find this is more than enough to sink your torso and begin your descent. On your way down use as little energy as possible. Conserve your energy and your breath hold will thank you in about 60 seconds time. Also, take your snorkel out of your mouth and when you reach the bottom you won’t need to worry about bubbles trailing out and spooking the fish. Remember not to get too excited when you see fish start to come in, control your heart rate and stay calm. Don’t start waving you gun around like you’re in a Western and thrashing your head from side to side trying to see everything that’s going on. You need to stay smooth and glide. Try to keep it to a minimum but if you want to look around you then do it in a calm and relaxed manner. You’ll get a feel for everything we are talking about but just to keep all in mind. Debatably, most hunting takes place between 8 – 12 meters. However, plenty of bass have been shot from a couple of meters down and past 25+ meters. It’s a common misconception that the deeper you go the bigger fish are. It’s almost like the Gods will reward you for going as deep as you can for as long as you can. Needless to say this is crab crap and while you can land a beast at those scary depths, you may also land it snoozing on a shallow sandbank on your swim home. The depths you hunt at can also depend on the current, tide or just the general area. The main thing is not to get obsessed with how deep you can dive and how long you can stay there for. It’s easy to do, especially starting out – however, it’s the wrong elements to focus on. They will both develop in due course. Welcome to the land of giants; hunting bigger fish requires bigger guns. The guns range from 140 – 160cm. Some people opt for 130 which is the best ‘in-betweener’ for both reef an blue water however you’ll find it a bit short. Whether you’re spearfishing in the UK or abroad, stepping up from hunting reefs to targeting pelagic big game giants in the deep blue is an enormous leap and must not be taken lightly. 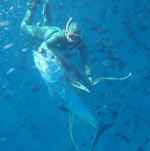 Blue water spearfishing is done away from the shallows in the open ocean. 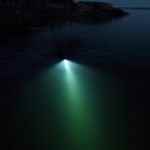 Using sounders, a spearo will normally target underwater panicles and ledges that drop off into the abysses. You want to be hunting on, in and around reefs. These are rocky or kelpy areas that normally hug the coast and extend out to the open ocean. Go on google maps and check out satellite images, they are all really clear and easy to spot. Look for interesting marks in the landscape like gullies or pinnacles that stick out of the water. 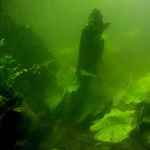 These are all interesting features that will probably attract fish and at the very least, well worth checking out. If you can see more than 3 odd metres then you have the right to get excited! The UK is not famous for its crystal clear visibility - however, when it comes, make the most of it because it’s amazing. Normally you will have 2 – 5 metres of ‘spooky as hell’ visibility and while it may well be reminiscent of Silent Hill, it's more than enough to land a 10lb fish of a lifetime. Shot placement is easy to figure out. First of all you want to mentally cut the fish in half sideways - the top half, above the lateral line, is the tasty tough flesh. The bottom half is just soft belly meat and while you can land a fish shot in the gut there is a good chance it will thrash off, escape and die slowly in a hole somewhere. 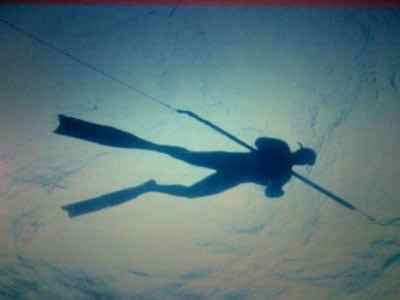 In an insanely brief summary, freediving is the art of swimming downwards through water with a single lungful of air. At the core of every good spearo is a good freediver. Even if you don’t want to hunt, freediving is an amazing sport and a fantastic way to explore our beautiful coastline. When people talk about freediving techniques, they are normally referring to breath hold techniques. 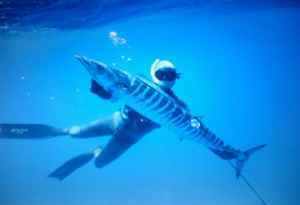 To be fair this isn’t really spearfishing as the sport would define itself - however, all spearos have caught fish this way so it deserves a mention, plus it’s a great way to get accustomed to being in the ocean. 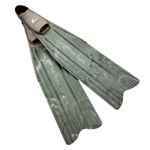 So you want to be fairly shallow between about 2 and 5 metres and go exploring the coast line. Try to find some kelpy areas as these tend to be the areas that hold fish. 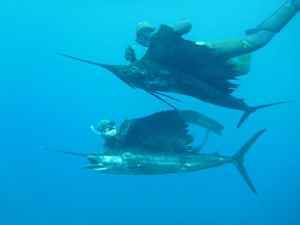 This is by far the most popular form of spearfishing. Relax, breathe up and descend to the sea floor. Now the type of terrain will determine the type of spot you are looking for. Assuming you are hunting kelp covered reef which is most common, about half way down you want to start looking out for your stalking point. Hole hunting is what separates the advanced spearos from the intermediates and shows in the size and volume of their catches. It’s a far more active form of hunting over the passive ambush techniques, can be rather acrobatic and benefits greatly from a good breath hold. It's also the most rewarding form of hunting in my opinion. 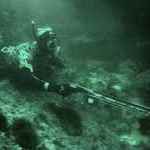 Spearfishing at night used to be frowned upon by the spearfishing community but as the understanding of this technique has grown, so has its acceptance as a challenging and exciting discipline. 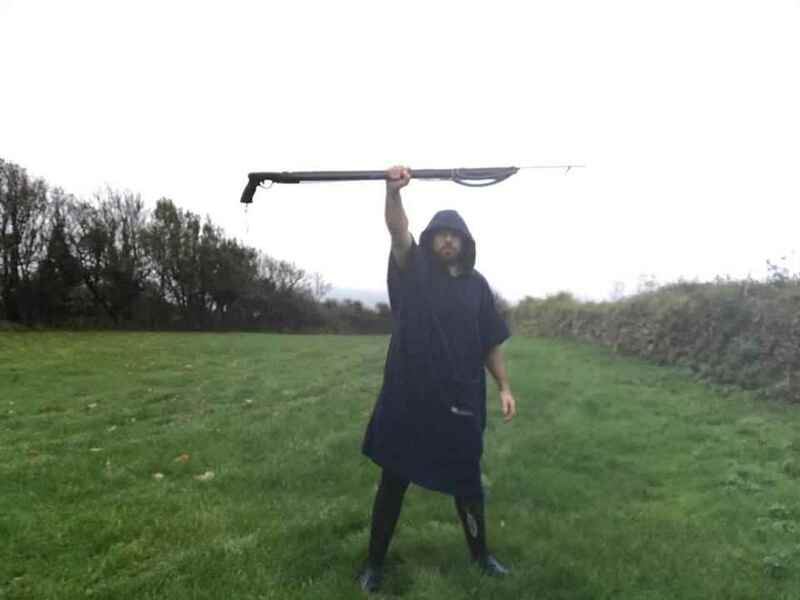 Nothing in life will make you feel more Chuck Norris than marching past a beach fisherman at midnight in a jet black / camo wetsuit, speargun in hand and swimming off into the darkness.